Rattan is a natural fibre which grows in the tropical regions of Indonesia and China. The outer skin of the long climbing vine is called cane. 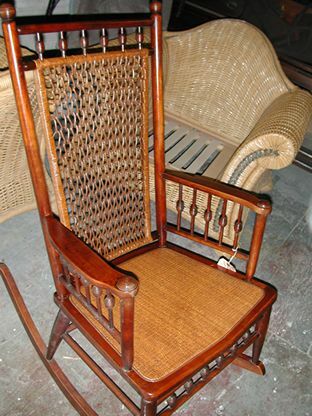 It has a shiny surface, is extremely strong, and creates a beautiful chair seat that will endure for decades.Wicker is actually made from rattan reeds or long slender, supple branches, usually willow, used for weaving items which are called wickerwork. Whether you say wicker furniture repair or repair rattan furniture you're pretty much saying the same thing, but technically speaking you probably should be saying repair reed, but not very many people do so we'll drop the repair reed term. Reed is the material that wicker furniture is made from. Reed comes from rattan which is a type of climbing palm that is very long and so it is good for continuous strips of reed. The reed may be round, half round, oval or flat, in many widths and diameters 1/16" up to 5/8" and you may find sizes larger and smaller.